We all love to save our hard-earned money. We clip coupons, join shopping clubs, and keep an eye on sales events. Saving money on fuel is no less desirable. In fact, since fuel can take up to 40% of a trucking company’s annual budget, saving at the diesel pump is a necessity. That means understanding the numbers behind all those fuel discounts is important. This way you know exactly how much you’re saving and how it’s calculated. Not to mention what it’s called. 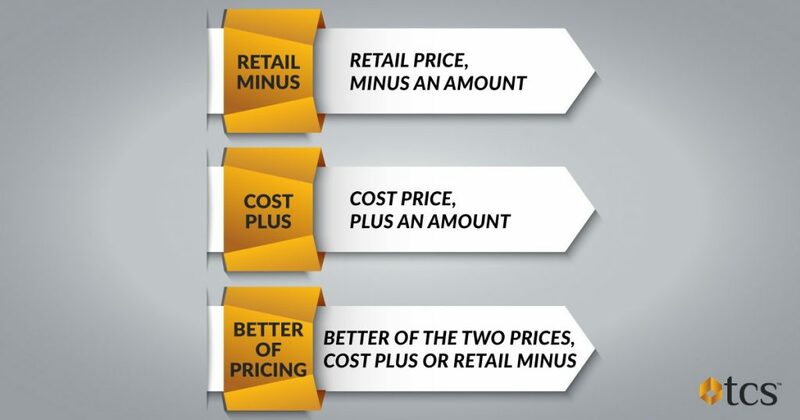 Let us toss out a few phrases – retail minus price, cost plus price, and better of price. We’re going to start with those three. All TransConnect Services (TCS) clients that fill up at “in-network” discount locations, which are fuel centers that offer savings for TCS Fuel Card clients, will enjoy either retail minus price, cost plus price, or better of price. Retail minus price – This is the retail price minus a negotiated discount per gallon. The retail price will always be the lowest posted pump price and is typically the price per gallon charged to customers who pay with cash or a fuel card. So, let’s say the retail price is $3.00 and the negotiated discount is 5 cents. You pay $2.95 per gallon. Cost plus price – Cost plus is the cost of a diesel gallon (with taxes and freight costs to transport the fuel from rack to truck stop) plus a pumping fee. When you see cost plus price, think of it as the price that truck stop is paying for each gallon of diesel, then add a few cents to that. If the cost price is $2.60 and the plus is 5 cents, you pay $2.65 per gallon. Better of price – This one is self-explanatory. This is the better of the two prices between cost plus and retail minus. Rest assured that TCS Fuel Card clients who are at an “in-network” discount center will always pay the better of the two prices. How do you find great TCS Fuel Card discount partner centers, the ones that are “in-network”? By using your TCS Fuel Finder, of course. You can access the TCS Fuel Finder through the TCS Client Site and the TCS mobile app available for iPhone and Android. As a TCS Fuel Card client you have a network of savings at your fingertips. It pays to seek out fuel centers that partner with TCS for great fuel savings. The long-term savings – weekly, monthly, yearly – make all the difference. But if you are a TCS Fuel Card client and you end up desperately needing to fuel up at an “out of network” location, you pay the cash price. Cash price – Also known as the retail price. This would be the lowest posted pump price, which is determined by the ups and downs of competition in the marketplace. This is typically the price per gallon charged to customers paying by cash or with a fuel card like the TCS Fuel Card. Which leaves us with one more price to discuss, the credit price. Credit price – This is the price charged to customers paying with a credit card, think Visa or MasterCard, and it is usually 6 cents per gallon more than the cash price. This price never applies to TCS Fuel Card clients. You’ll never pay that amount with our fuel card. If you already have the TCS Fuel Card, you know about the exceptional customer service and the array of great diesel savings. If you don’t yet have a TCS Fuel Card, we want you to start saving. At TCS, our mission is to level the playing field between small to medium-sized trucking companies and the larger fleets. Are you ready for your TCS Fuel Card? Let us get you saving on diesel and enjoying exceptional service. Sign up today! Please visit our website, or give us a call at 844-827-7705.